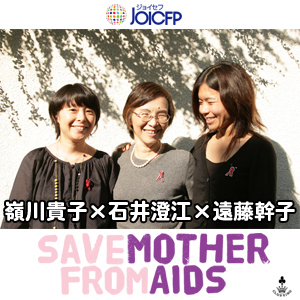 The first encounter of me, Mikiko Endo, and JOICFP was in November 2007 in the podcast program ‘SAVE MOTHER from AIDS (Takako Minegawa, Sumie Ishii, Mikiko Endo)‘ of ‘Club King’ with the topic ‘HIV-positive women in Ghana and Zambia’ who raise their children with any energy they have, and I, as a mother, was really impressed by the stories about these strong women. Honestly, before it began I was a little bit discomposed and asked myself questions like ‘what will you feel when you see this misery?’ or ‘what is an appropriate reaction?’. But when I saw the program the first time, I was amazed by how strongly and with how much vitality these women resist the difficulties in their life. So which way is better? Abundant things and information, as well as convenient child education like in Japan? Or a child education, where humans and nature always go hand-in-hand, although medicine and knowledge are low, like in Africa? Even though we don’t know each other, I suppose these women have a really strong heart. So some day, I said to myself, I want to become friends with them, meet them and talk to them!With the germination of this idea the first encounter with Africa was made. ©2003-2019 Mother Architecture. all rights reserved.